NEW YORK -- Matthew Howard Sr. was just leaving a New York amusement park Saturday evening with his family when he heard someone screaming for help. He looked up to see a young girl dangling about 25 feet off the ground from a slow-moving gondola ride as the sun was setting. 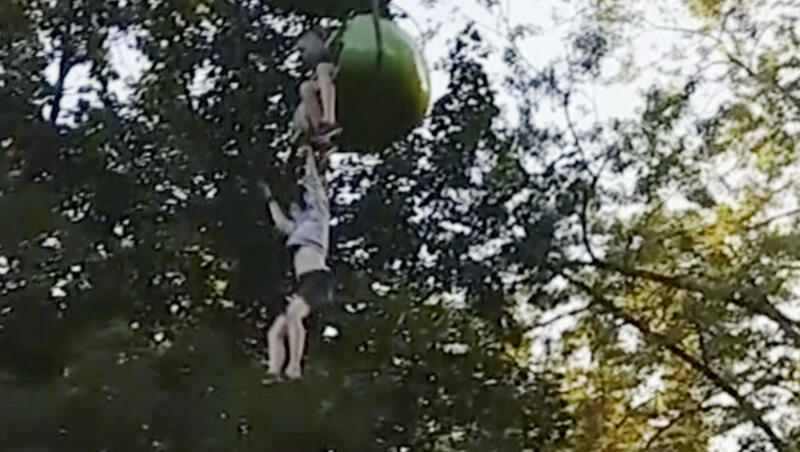 Her little brother sat next to her in the green two-person pod, crying hysterically, saying he couldn't hold on. Howard, 47, and his 21-year-old daughter, Leeann Winchell, ran over and positioned themselves under the girl as the ride stopped and security came running. A crowd of onlookers gathered, many filming, others calling for help. "I said: 'It's OK! It's OK to let go, I'll catch you, honey,'" said Howard. The girl lost her grip and fell down where Howard and Winchell, arms outstretched, waited with a few other good Samaritans. The two took the brunt of the girl's fall, tumbling to the ground themselves after the catch. She was lifted up and carried to a golf cart where emergency workers arrived to help her, witnesses said. Howard, a contractor from Schenectady, was treated and released for a minor back injury after the rescue. "I couldn't let that little girl die," Howard told The Associated Press on Sunday. "No one wants to put himself underneath a body like that, but I couldn't stand by and watch." The 14-year-old girl from Greenwood, Delaware, was taken to Albany Medical Center in stable condition with no serious injuries, the Warren County Sheriff's Office said. Winchell, who is applying to be a nurse, said they visited the girl Sunday at the hospital and she was in good spirits. Her little brother was shaken up but uninjured otherwise, she said. They didn't know how she'd fallen out of the ride. "I'm just glad we could be there to help," Winchell said. "We were in the right place at the right time." The accident happened on the Sky Ride at Six Flags Great Escape Amusement Park, about 55 miles (89 kilometers) north of Albany, New York. The ride was stopped by an operator after getting word of a rider in distress — it had been higher up at one point. Loren Lent, from Glenville, said Sunday that his 10-year-old daughter and wife had also been on the ride and watched from high above as the girl fell. "My daughter was just traumatized," he said. "She was crying for about a half-hour after." Lent said he thought it took too long for park employees to stop the ride and render aid. He said the ride has no seatbelt; just a bar across to hold patrons inside. "I'll never let my family on that ride again," he said. On Sunday, park officials said the ride had been cleared for operation, but would remain closed. "We are reviewing our internal procedures to ensure the safety and security of our guests and team members," park officials said. Two safety consultants contacted by "CBS This Morning" said these types of gondola rides have good safety records. They also said when something does go wrong, it's usually because of something the rider did.